It has been 18 years since the Royal Ballet performed a work by a female choreographer on its main stage. So 'Flight Pattern', a new piece by the hugely sought-after Canadian dance-maker Crystal Pite, feels like an event even before the curtain opens. 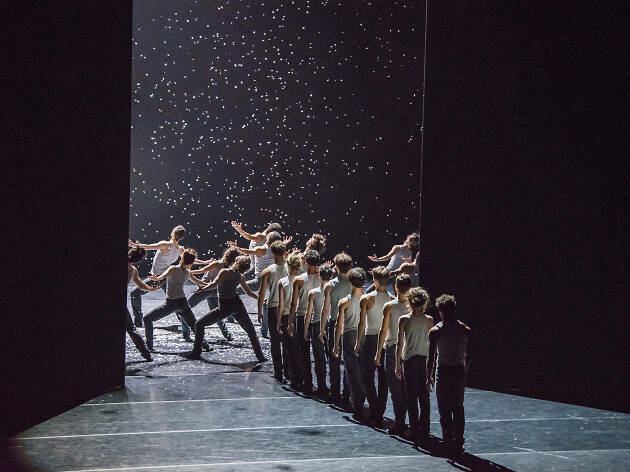 The 30-minute ballet is her response to the refugee crisis and it’s scored through with a sense of the epic, from its surging mass of 36 dancers to its searing use of Gorecki’s 'Symphony of Sorrowful Songs'. 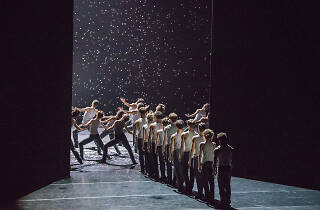 Dressed in drab grey overcoats, the dancers stand swaying in a group; layered movement ripples the crowd as they edge forward like a lava flow, the imposingly stark scenery and lighting shifting and changing the space around them. The mass of bodies at moments recalls Rodin’s 'Gates of Hell'; individuals caught in the churning tide burst out with gestures that hover between hope and despair. We zoom in on Kristen McNally, nursing a bundled-up coat like a baby, then, racked with grief, dropping it to the ground. As the sides of the stage close in on the group trudging towards what looks like fluttering snowfall, Marcelino Sambé lingers behind, punching through a wrenchingly anguished solo, gasping and crying out as he contorts with anger and hopelessness. Anyone who saw Pite’s Olivier-nominated 'Betroffenheit' last year at Sadler’s Wells knows she can plug into complex and savage emotions with unnerving precision – Flight Pattern is another harrowing example. Sambé also shines in David Dawson’s 'The Human Seasons', which opened the evening, a precision-cut work inspired by Keat’s poem that equates the ages of man to the seasons of the year. That progression is hard to discern in the piece, but the surging swells of Greg Haines’s lyrical score and the constant motion of the four couples and chorus keep a sense of elegant momentum; there are moments of sculptural beauty and some rather disconcerting lifts. Chistopher Wheeldon’s refined 'After the Rain' suffers in the middle, but Marianela Nuñez and Thiago Soares are wistfully tender and achingly sad to watch in the pas de deux that makes up its second half.